The Comprehensive Musicianship through Performance (CMP) Project was initiated in Wisconsin in 1977 as a means of assisting teachers with the development of performance with understanding in school music programs. The project began with a group of respected music teachers from diverse school districts and a project steering committee which facilitated development. The teachers and steering committee developed and field tested a process for planning and carrying out instruction in performing groups. 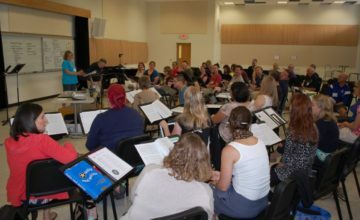 In the CMP process, the rehearsal is seen as a laboratory where students can develop an understanding of musical concepts such as expression, melody, rhythm, harmony, texture, timbre and form by being involved in a variety of roles including performing, improvising, arranging, composing, conducting, and analyzing music. The CMP Model was developed through a careful examination of the teaching/learning process in music performing groups. The learner and the music are central to the CMP planning process. Though the five components of the model are equally important, planning instruction can begin at any of the points. For instance, the selection of music is often a starting point for planning but the decision about what music to use may be based on assessment of student needs or previous learning. Assessment is appropriate before, during, or after the process of study. A desired outcome may be identified through the assessment process or outcomes may be stated in a local curriculum guide. It then becomes the task of the teacher to select music which is appropriate for working toward that outcome. Analysis leads to recognition of those music elements that need to be learned to develop Comprehensive Musicianship through Performance (or understanding through performance). Strategies are the ways in which the teacher attempts to bring the music and the performer together to that quality performance and meaningful learning can take place simultaneously.